People who live in places where they have a large yard area, can choose to have a swimming pool installed or erected. These products come in a variety of sizes and shapes to suit anyone’s personal preference. The downside of having a large pool was in keeping it filled with clean water. Not only is refilling a pool time consuming, it is also taxing on people’s utility bills. A better way to keep water clean is by using a swimming pool cover. These are the large blue vinyl coverings often seen on in-ground and above ground pools. The benefit of using a cover for swimming pool surfaces is the ability to keep dirt and debris from getting into the water. Every day leaves, twigs and other items are blown around a yard or falling off nearby trees. 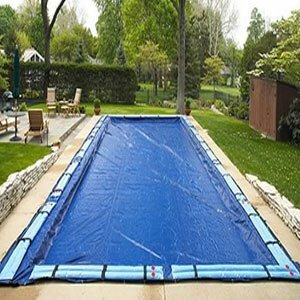 The covers will also keep out bugs and other pests you do not want to see floating around when you are ready to take a dip. An above ground swimming pool cover can be found made as the classic vinyl or as a fine mesh. The mesh material allows rainwater to penetrate the surface while keeping leaves and debris out. In addition to keeping out dirt, a swimming pool cover can be used to help hold in heat. The basic vinyl material is designed to hold in a degree of heat when the water is at a certain temperature. This means owners do not need to run a pool heater as often, which also saves money on their utility bills. There are also specially designed solar covers, which have a multi-layered substance created in a similar fashion to bubble wrap. These are often referred to as blankets and actually absorb heat from the sun and transfer it to the inside water. There have been some new innovations made in designing covers for pools. The automatic swimming pool cover is made for use on in-ground models and works through the use of motorized power source located away from the pool area. A track is laid either on the inside edge or along the outside surface where cement or tiles are laid. The rollers attached to the material easily glide along the track when the item is opened or closed. These automatic models are available in sizes to fit the length and width of most pools. Having a place to swim is a luxury most people enjoy having, which is made even better through the use of energy saving covers.